Headphone amp of mortality finally reaches UK | What Hi-Fi? The Marquis ‘Memento Mori’ from Metaxas & Sins is a £6000 preamp/ headphone amp with VU meters for eyes and a headphone socket in its jaw. We're still a few months from Halloween, but let's make no bones about it - that's no reason to hold back from picking up some spooky-looking hi-fi equipment. 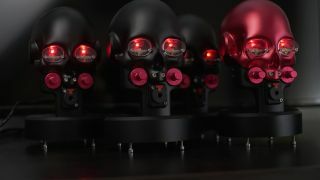 Metaxas & Sins has designed a solid aluminium preamp/headphone amplifier called Marquis ‘Memento Mori’ (Latin for "remember you must die"), and it looks as if it arrived directly from Metropolis or The Terminator. As well as promising high performance, it's the perfect place to rest (in peace) your expensive headphones when they're not on your own flesh-and-blood skull. The Marquis 'Memento Mori' has a bare-bones feature set. There are two red controls, one for controlling volume and the other for selecting input, with the 6.35mm headphone socket underneath - where the jaw really ought to be. In the eyes of the skull are VU meters, each needle reacting to the incoming signal level. The ticking meters keeping you constantly aware of the ticking of your own biological clock, as you slowly approach the grave. The skull's power supply is hidden in the base, but you can get a five-hour battery pack that apparently offers "real portability" for those that want to carry a big expensive skull around with them. At 6kg, it's not an easy carry either. The Marquis 'Memento Mori' is finally available in the UK, from Audio Sanctuary. It's priced at £6,000 (with premium finishes of red, gold, silver, purple, and clear available for an extra £250). See all our Skullcandy reviews. Geddit?